Mobile lifting gantries are available in 2 main styles, Lightweight aluminum and steel. Aluminium gantry frame options online are A Frame and T Frame. All our aluminium gantries are fully adjustable and very portable compared to a standard steel gantry. Some gantry models are suitable for un-level and uneven surfaces. All terrainand removeable leg designs can also be supplied. Gantry capacities range from 500kg up to 3000kg. includes a fragile surface gantry with multiple air castors to spread the load. C profile and I profile gantry models from 500kg up to 5000kg online. Steel gantries can be built to specification to suit your application. Moveable under load and not moveable under load options are also listed. I Profile Mobile Gantry with 500kg – 5000kg SWL, Built to Specification & Moveable Under Load. Inner braced – decreases the amount of usable trolley travel / lifting area. Outer braced – gives full width trolley travel though increases the overall width of the gantry. Inner braced with full trolley travel – similar to the first option without reduction in lifting area. Standard Wheels (castors) are in white nylon though can be supplied to your specification; e.g., rubber tires, rough terrain capable, spark resistant etc. all wheels are ‘Swivel’ though we can fit them with brakes if required. 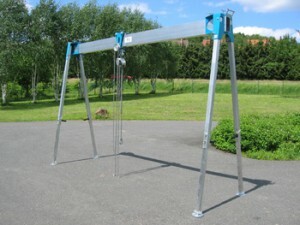 Manual gantry cranes are mobile on wheels for indoor or outdoor use, painted of galvanised. Painting: 2 layers paint system. Yellow RAL.1028 or to your specification. This gantry crane can be mobile even under load on a clean floor. To be moved under load the gantry must on a level / flat floor and the lift must be conducted by a suitably competent person. Mechanical-welded / bolted construction, can be entirely dismantled in for transportation. Mobile lifting gantries are available in capacities to suit your requirements from 250kg to 5000kg (and above and required). The span is the distance between the Vertical ‘A’ frames, height of lift is the distance from the floor to the underside of the lifting beam; once again this is to suit your requirements. Parking shelters are suitable for mobile ‘A’ frames that are used outdoors to provide weather protection. Parking jacks are used to level the gantry prior to conducting the lift. Designs of mobile gantry shown are for illustration purposes only, drawings will be issued for approval prior to manufacture. We can supply lifting equipment (hoists) to suit your requirements, manual, electric or pneumatic. Our engineers have designed and supplied electric power travel mobile lifting gantries with electric travel in all directions. Details available on request. 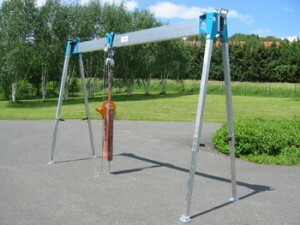 C Profile Mobile Gantry with 500kg to 2000kg capacities, 2m to 5m Span and 2m to 3.5m Clearance, Not Moveable Underload. 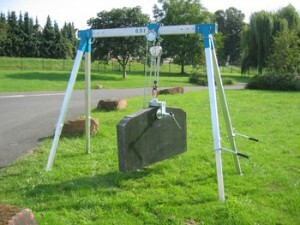 Portable C-Profile Gantry – Not Moveable with load. Lightweight aluminium gantry crane with split beam option and capacities from 1000kg to 2000kg.